In 1890, when William Waldorf Astor demolished his grand family mansion on Fifth Avenue at 33rd Street to spite his sister-in-law, Caroline Astor who lived in the matching mansion next door, he knocked over the first domino in a chain that would transform the avenue forever. By the time the hulking 13-story Waldorf Hotel was completed on the site three years later, the fashionable residential avenue was already seeing subtle changes. Three blocks to the south, at the corner of Fifth Avenue and West 30th Street the Romanesque-Revival Wilbraham Hotel opened; the first non-private residence in the area. Half a block from Fifth Avenue on West 35th Street was the Oakdale Hotel which, like the Wilbraham, was a residence hotel for bachelors. The need for bachelor hotels – actually apartment buildings by today’s definition—arose after the Civil War when cities filled with unmarried men seeking employment. Called “bachelor flats” they addressed the problem respectable unmarried gentlemen found in obtaining living quarters. Like the Oakdale, they did not offer kitchens in the apartments since bachelors neither intended nor were expected to cook for themselves. The Oakdale replaced the two mansions at Nos. 36 and 38 West 35th Street. Six stories high, it sat on a rusticated limestone base. Above, the architect complimented buff-colored brick with exuberant terra cotta ornamentation. Here Italian Renaissance met Beaux Arts in a structure that was at the same time formal and just a bit ostentatious. 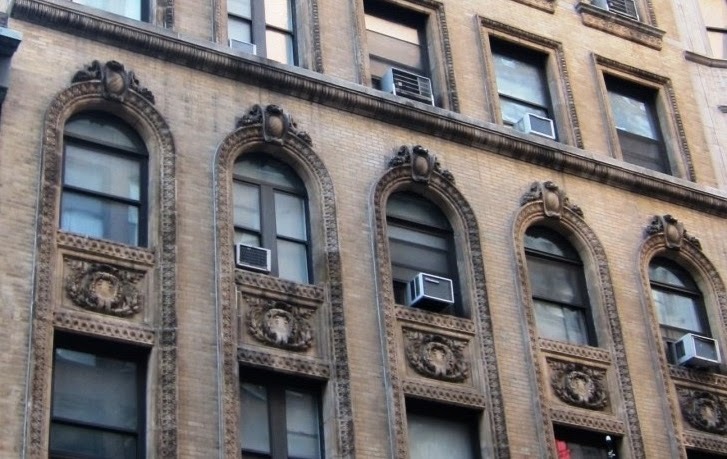 Terra cotta in deep relief adorned the brick facade, coming to a climax at the sixth floor. Among the well-to-do tenants in 1893 was at least one actor. Comedian and singer Charles H. Hopper was the son of George H. Hopper whose family had made its fortune in Standard Oil. Although the younger Hopper found his career interests far apart from the oil business, he made his own fortune. As well as living at the Oakdale, he maintained a country estate called Driftwood. Problems came for the popular entertainer while he was playing the part of Calendar Maker in Sidney Rosenfeld’s production of Rainmaker of Syria at the Casino. The play was a failure and the cast had not been paid in over a week on October 9, 1893. Hopper ran into Rosenfeld at the stage entrance where he was arguing with cast members regarding the back pay. The actor punched the producer, staggering him backwards and causing him to fall against a gas jet and break his glasses. Hopper was held on $300 bail at the Jefferson Market Courthouse. Few residents drew such publicity. The Oakdale filled with professionals, many of whom were physicians. Among them was Robert Hawthorne Wylie who lived here for over a decade, beginning around 1896. Wylie had worked in hospitals in Vienna, Paris and Berlin and was one of the most respected gynecologists in New York. The successful doctor was a member of several men’s clubs and owned a summer house in Ardsley-on-Hudson. The list of other doctors living here included Patrick Henry Fitzhugh, osteopath Lamar K. Tuttle, and W. G. States. 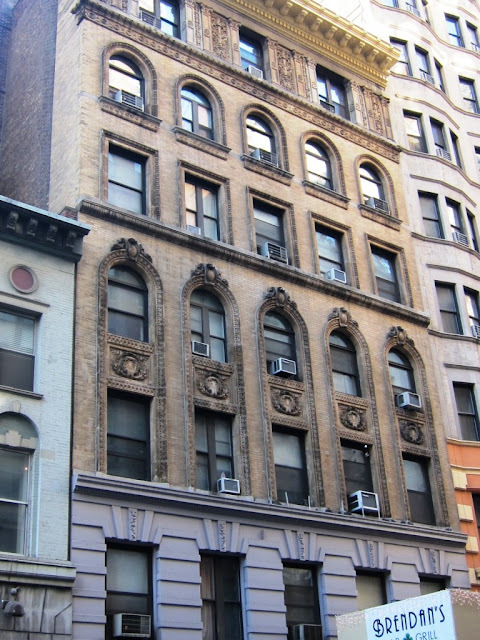 Young attorney Ernest A. Jackson was already a member of the firm Perkins & Jackson when he died of pneumonia in his apartment here at the age of 26 in 1897. William H. Higbee died in his apartment here on September 21, 1900. The retired, 61-year old Higbee, whom The New York Times said was “prominently known in club life,” was a member of the Lotos, Reform, New York Yacht, American Yacht, Union League and the Olympic Clubs. Actresses of the day were not expected to conform to the rules of polite society and Marie Burroughs did not disappoint. Born Lillie Arrington in San Francisco, she traveled to New York at the age of 17 in 1883 to become a star. A decade later she had accomplished her goal. 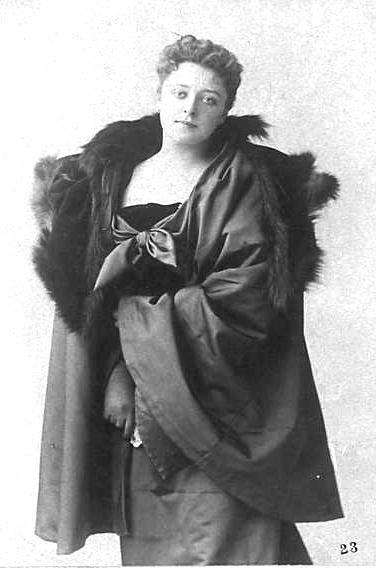 The attractive actress was regularly seen on stage starring in productions such as the 1890 The Battle of the Strong, The Profligate in 1894, and the 1899 production of The Meddler. Eyebrows were no doubt raised when the entertainer took up residency in the Oakdale’s male-only sanctuary in 1901. The same year that Marie Burroughs moved in, the up-to-date Oakdale had telephone service; an amenity that no doubt helped to maintain its high-class reputation. Attorney George Murray Wright was living here at the time. Formerly of the Attorney-general’s office in Albany, he was a member of the New England Society of New York and the Metropolitan Museum of Art. 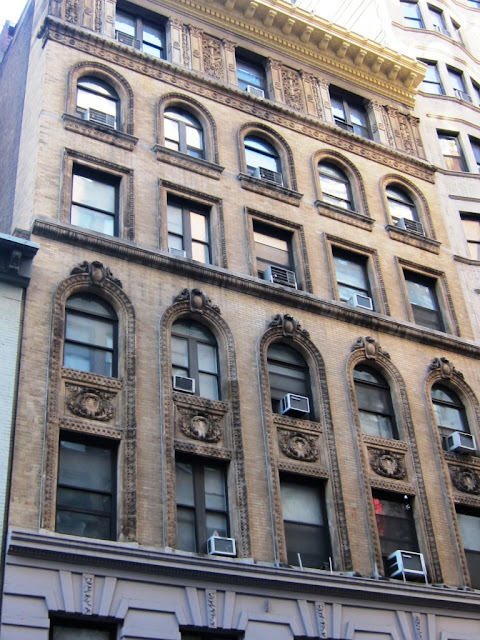 When brothers Jefferson and L. Napoleon Levy sold the Oakdale in 1905 to Jacob Neadle, the sale included the three-story “business building” next door at No. 34; a converted residence. The following year Dr. J. N. Luning who lived here would cause nation-wide speculation among the legal profession regarding a speeding ticket. While motoring along on a Friday afternoon in Leicester, Massachusetts, the doctor was caught speeding by Chief of Police James A. Quinn. After posting $50 bail, he was summoned to appear in court on August 9, 1906. On the day of the hearing, when Luning’s case was called, a young man from the law offices of Charles M. Thayer stood and pleaded guilty for the doctor. The judge, Hollis W. Cobb, was taken aback. Never before had a defendant had the impertinence to send someone else to the courtroom where he was personally ordered to appear. The judge pointed out that “Dr. Luning should be present in person, whether it put him to considerable trouble or not to come on here from New York, as that was one of the penalties of breaking the law.” He asked the young man if he would willingly accept a jail sentence in the doctor's place if he did not see fit to impose a fine. The judge finally imposed a fine of $15. Several publications mentioned lawyers' speculation that Dr. Luning’s case would set a precedent regarding defendants’ appearance in court. The Oakdale continued to attract professional residents throughout the first quarter of the century. In 1914 resident A. W. Warren bought a new, expensive Cadillac motorcar, while others living here included Dr. Joel Ives Edgerton, architect Edward Perce Casey; George W. Dewey, director of the Niagara Fire Insurance Company and Mark G. Holstein, “private collector of general literature, Shakespeariana, history and books about books." The same year that Holstein was filling his apartment with rare books, in 1922, playwright Eugene O’Neill was living here in bad health. As documented in the 1988 “Selected Letters of Eugene O’Neill,” the writer sent a letter from the Oakdale to his brother, James O’Neill, Jr. regarding his health and a proposed trip to see their ailing mother. A decade later retail space was worked into the lobby area. Webb Napp, Inc., purchased the building in 1944 along with the little three-story building next door which was still part of the deal. By now West 35th Street had become fully commercialized and decidedly unfashionable. Bachelor flats, by now, were a thing of the past. In 1950 the building housed retail space, the hotel lobby and office on the ground floor with seven apartments per floor above, termed a “permanent and transient” hotel. But after a few decades of shaky existence, the once-fashionable Oakdale made a comeback. Now converted to 37 coop residences the handsome Oakdale Hotel, where wealthy bachelors, an American playwright and one feisty female actress lived, has been saved from neglect.